If you’re lucky enough to have some (mechanical!) help with your dishes, how’s your helper doing these days? Cooking can be tough on the dishwasher. All those goopy soups, milk-crusted mugs, and baked-on casseroles can overload it; perhaps you’re feeling like things aren’t running so smoothly or smelling as good as they ought to in there. 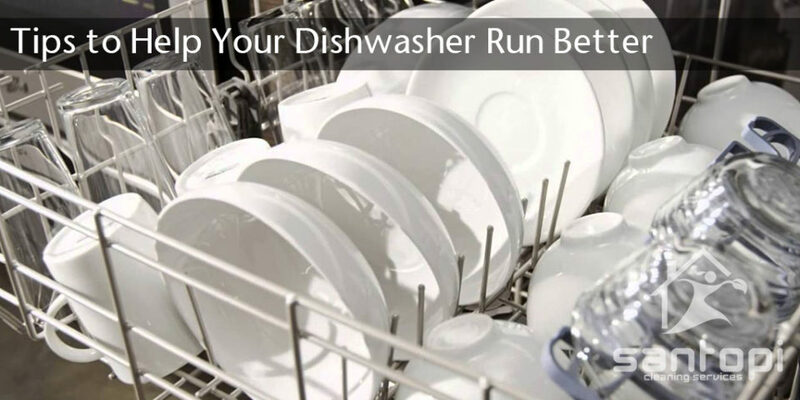 Well, we’re here to help, with 10 tips for making your dishwasher run its best. Are these tips familiar to you? I was already doing several of them, but a few were new, so I thought they might be to you as well. Don’t confuse scraping with washing: No one wants to wash their dishes before they wash their dishes; it’s just silly. But you wouldn’t want to eat a Thanksgiving dinner and then go run a marathon right after. Well, neither does your dishwasher. Scrape food bits off before loading up to help reduce particles stuck on dishes once the cycle is over. Don’t overcrowd the dishwasher: It’s something that’s easier said than done. It’s quite tempting to layer in one more bowl or plate to avoid hand washing. Just remember, it’s better to wash a few pieces by hand than it is to rerun an entire load because things were too tightly packed. Run hot water before starting the dishwasher: Before starting the cycle, turn on the faucet and run until the water is hot to the touch. This means your first dishwasher fill cycle will be hot, instead of cold, until it finally makes its way over from the hot water heater. This is an especially important tip in winter time, as it takes longer for the water to heat up. Use the correct cycle: It can be tempting to use a shorter, lighter setting to save on time and water bills, but make sure you’re washing all your super dirty dishes by hand if that’s the case. Just like doing your laundry, keep soil levels together when washing to end up with the best performance. Don’t double up on rinse aid: When looking to purchase a new soap for your dishwasher, make note if it includes a rinse aid. If it does, then there’s no need to add any extra. If it doesn’t, skip the extra purchase and just fill the reservoir with white vinegar. It’ll do the trick every time! Run an empty dishwasher with vinegar: It’s the same concept as running a vinegar load in your washing machine. You simply toss a cup of white vinegar into the bottom of an empty dishwasher and run a normal cycle. It cleans out old food particles to keep your dishwasher smelling fresh. Clean the dishwasher trap: Down in no-man’s land, under the lower sprayer, there’s usually a piece that is removable. Under it you’ll usually find bits of food that didn’t make it out the drain or even pet hair (eww) if you have a fur-ball of any kind running around your home. Sometimes the tray comes out fully so it can be rinsed in the sink; sometimes a towel is needed to remove the gunk buildup. Clean the dishwasher seals: After a few months of use, your dishwasher accumulates a little bit of ick and stick around the rubber gasket in the door and often around the soap door as well. Make sure to give them a once-over with a damp towel to keep the grime down. Check your water heater’s temperature: There’s a joke about where to put the thermometer, but we’ll pass this time around. Make sure your water heater is set between 120 and 125 degrees. Many units are shipped new set to a much lower heat. This is the ideal temperature for washing dishes; don’t be tempted to turn it higher or else it will cause water to flash dry and not roll off your dishes, taking the ends of the dirty bits with it. Those are some of the simplest solutions if your dishwasher is leaving grime on the dishes, or not smelling so fresh. Have you found other good practices for keeping that precious dishwasher running well?